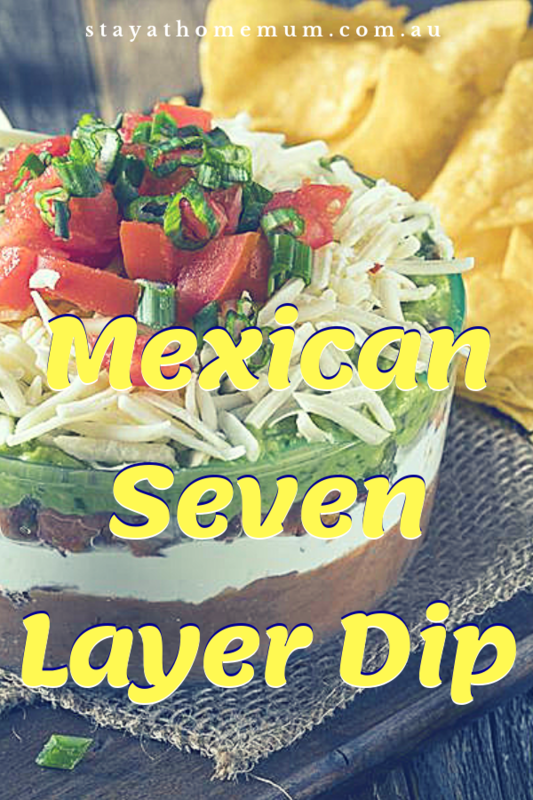 This is a very traditional recipe for the good old fashioned Mexican Seven Layer Dip. Refried Beans (if you have never tried them) are just delicious. If you find them a little bland and want to pack a punch in taste, season with salt and pepper and add some chili or paprika. This recipe can be made ahead and kept in the fridge for up to two days. In a small bowl, mash the flesh of the avocado with a fork, adding the lime juice to prevent browning. Set aside. Mix together the sour cream and the mayonnaise. Set aside. Grab a trifle bowl or glass bowl to hold all the ingredients (see-through bowls are preferable to be able to see all the layers). Pour the refried bean mix into the bowl first, and flatten with a spatula. Add the layer of sour cream and mayonnaise. Flatten with a spatula. Add the chopped tomatoes on top and sprinkle with chili flakes if desired. Dip will last up to two days in the fridge.